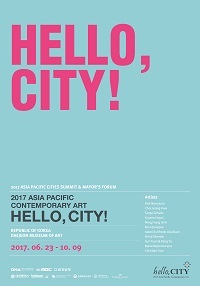 Hello, City is a polis of the imagination, a meeting place where every Asia Pacific city can come to seek collaboration and harmony through cultural exchange. The twenty-seven artists featured here have created their own Hello, City, a creative and future-focused world based on their own experiences of the world, crossing the boundaries of nation, race, language, religion, and more. Each of this diverse collection of works offers new visions of city life and the world of future, with an emphasis on the power of human creativity. Art is a meeting place that welcomes the creativity of every culture. The cultures and ideologies formed as a product of history can here be woven together into something new, a future of pan-cultural cities and civilizations based on harmony and mutual respect. Hello City is a world in which human creativity allows us to apprehend, today, a future thus far only dreamed of.